That was the best 2 1/2 hours spent at the movies, watching Inception. Love the idea, love the movie, love the cast. Just love it. It is in the top of my movie list this year. If you have not watch it, GO! After days of listening to people rant about how good that movie is and reading Facebook status about how good that movie is (and is convinced that that movie is good, since my fave actor Leonardo DiCaprio is in it) I had to go and watch it!!! Like seriously it was awesome. The concept, just great. :) I don't mind watching it again...over and over. The cast of the movie is amazing, I love Leo DiCaprio so this was a must watch movie for me. :) I actually didn't know Joseph Gordan-Levitt was in it too, that was awesome and refreshing. I would watch this movie again. And I am glad we only have to pay RM5 to watch it. So worth the money and time spent. :D I am a happy kitten tonight. One shows Sneijder and the other, of course, the World Champ., Spain!!! :D Love these!! I don't know if I am just being paranoid or what but I feel like I am just pulling away from the people I love, bottle up inside. I get hurt and I don't want others to get hurt too. I am feeling a lil stress, and confused and kinda ignored. That's just how I feel. Like I am not there...I am not whole. Just listening to this song makes me feel better but sad, it is a beautiful song. Altho to me it is a sad song, mopey, I hate being mopey. but I can't let go of what's in front of me here. Leave me with some kind of proof its not a dream. Had my last breakfast with my sister before she goes back to school. It was a long morning and I had little sleep the night before. My sister had this for breakfast, consists of chicken, tofu, cucumber and some other yummy stuff. My sister had a good time. And icy fun, shaved ice and all. This won't probably be the last World Cup related entry. Since I just found out a few stuff I didn't know about everything, I might share some. 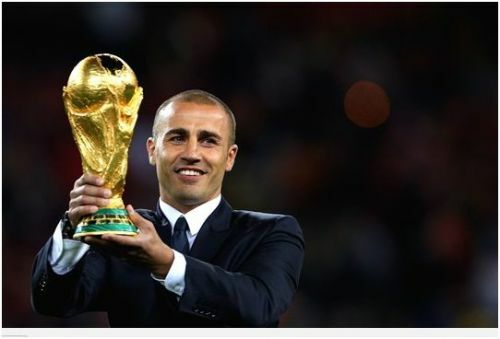 :) I don't know if you knew but after the games have been played there are a few awards that are given out to outstanding team, outstanding player, goalkeeper and the works, so just for me to remember 2010 by here's the list I got from fifa.com. Diego Forlan from Uruguay named the Best Player ahead of Netherlands' Wesley Sneijder and Spain David Villa. Thomas Mueller from Germany won this award ahead of Wesley Sneijder and David Villa (see these 2 names always comes together, I think they would make a great partnership!). All 3 had 5 goals and they were separated by the number of assists, which Mueller have 3 and Sneijder and Villa only have 1. This award is given to the one that scored the most gold. Spain goalkeeper Iker Casillas is one of the best. :) He only conceded only 2 goals in the tournament and got him the golden glove. He is only 20 and one of the most prominent player in the game altho they didn't win the cup but he helped Germany win 3rd place. And of course last but not least the tournament standings. And to think that four years ago Spain only made it in fourth place and this year won the cup, they have a really long way to defend their cup and hopefully David Villa will be playing in the next World Cup! It was not the best game of the World Cup. And it was a 1-0 victory after 116minutes of play time...but it wasn't that boring either. I will have to say the 3rd place match was a lil livelier. 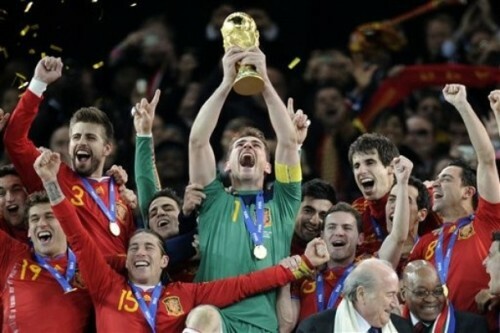 :) But I am happy Spain won, their first ever final game and they won. The are the history boys!! Two years ago they won the Euro cup and now the World Cup. :) I just am sadden that the Oranje team didn't get to go home with the cup, there can only be one winner. Right? They have been to the finals 3 times and did not lift the trophy. I can't wait to see them play in the 2014 World Cup. They did a real good job the Dutch...but not good enough to prevent Iniesta to score the only goal of the match. It was also Giovanni van Bronckhorst last game. I am sure he must be the saddest player there, so close yet so far. So long World Cup South Africa 2010. It has been a great 1 month together, till we meet again in Brasil in 2014! So in a few hours we will see who is going for glory...at least 3rd place. Since Paul have had death threats lately (and I was convinced by someone that they will not harm, or eat Paul...hopefully) I am really scared for the octopus. Although I think all of this is just a mere coincidence...right? Come on, he is just an octopus...:) Or so it seems. I never really care for octopus before, they give me the squeamish feeling...you know. Anywhooo...so this morning it would be Germany vs Uruguay...honestly I would like to see Uruguay wins it. No offence Germans fans, it's not like every 4 years Uruguay makes it to the semis...and they could actually make it to the finals too. Next time for sure!!! Man of the match for that game was Thomas Mueller. :) I think that guy plays great football and too bad he wasn't available to play during the Spain v Germany match. I think they might have a chance to win the game. Then again if they did win, we wouldn't be crowing the new champion of the world tonight (for me as I am watching the final game as I write this). 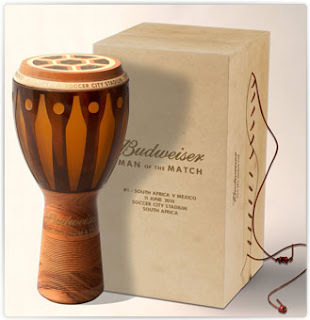 The man of the match trophy is one of the most unique I have seen so far...then again I never really pay any attention to that stuff. I am going to vote for the man of the match this final game. I deserve the right :D. Oooo can't wait. Am going to watch the game now. Will see who will be champion of the world...soon. OMGIAMSOHAPPYRIGHTNOW!! I have been busy with the world cup games and rooting for my fave teams (SPAIN!! yay! Holland and well I was hoping Argentina would make it too but the revenge is already executed by the Spaniards!! HAHA!) and today I just have to write something. :D Spain made it to the finals. For. The. First. Time. EVER! I am so happy!! And going against the Netherlands...couldn't be happier. Since both of my fave players plays for both teams (V Persie and Fabregas) it is undecided for me who I want to win. I do hope that Spain wins cause it is their first ever time to the finals. And they deserve it. Although I do hope Torres get a score at least and Villa get the golden boot. :D I like Sneijder but you know...it's an all Spain affair :P.
Am also looking forward for the Germany v Uruguay game. I think both teams are great! They display great football skills and they have scored impressive goals. I am looking forward to Muller and Lahm to play...and I think they game will be a great one!! Too bad all four teams can't make it to the finals...or it wouldn't be call a FINAL ^_^. And finally, PAUL was right!! I hope he is safe somewhere in Germany. :) Please don't eat Paul. 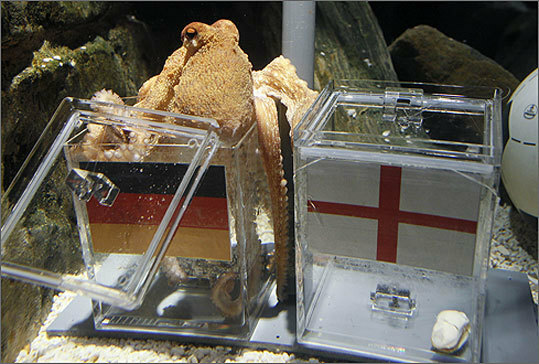 He is a good octopus...who could predict matches. :D I think he will be very famous now!